Back by popular demand – An evening learning the fine art of Stand Up Paddleboarding on the tranquil waters of Mixenden Reservoir. Each session is limited to 8 people at a cost of £18.00 each. 6.30 pm till 9.00 pm. 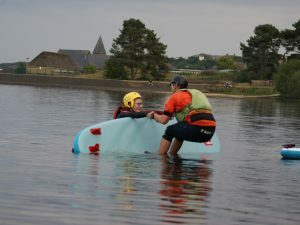 You will need your own Wetsuit kit but Helmets and Bouyancy Aids can be provided if you haven’t currently got your own . To secure your spot – you must email me – its first come first served for each of the evenings then payment made at the Membership sign up night or direct to Halifax Canoe Club – further instructions in due course. 2018`s two evenings sold out quickly so I`ve put a 3rd night to maximise attendance . It really is great fun- send that email, book your spot !